Imagine the birthday child being levitated! Magical Fun! Stephen is a magician member of the World Famous Magic Castle. 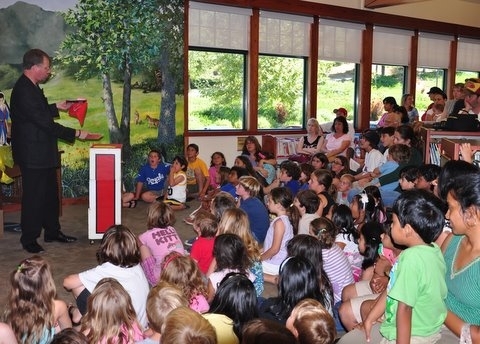 His high energy comedy magic show is enjoyed by "children of all ages"! There's lots of fun, laughter and audience participation with special attention paid to the birthday child/guest of honor. For special events and occasions, Stephen can be a strolling magician and do close up and parlour magic. Stephen has over 35 years experience in entertaining children and adults alike! Stephen uses a combination of magic, story telling, and audience participation and offers Birthday Party Magic Show Packages, and entertainment for family events, schools, groups and corporations in LA, San Fernando, Conejo and Simi Valleys. I have seen Stephen the Spectacular perform on many occasions and I think he is phenomenal. He is entertaining for both adults and children. The best part is how much enthusiasm he puts into his performances and how much he enjoys performing. Definitely someone you'd be completely satisfied and even impressed with hiring for your next entertainment opportunity. A Must See!!!! Stephen the Spectacular was spectacular! An entertaining and fun show that will turn your party/event into something special. Stephen will spend time after the show talking with the kids/adults and doing balloon animals. A great show! Mentalism, Levitation and other surprises abound. Stephen the Spectacular is a magician member of the World Famous Magic Castle, the International Brotherhood of Magicians and the Society of American Magicians. He has over 35 years experience in performing for all ages. Although Stephen specializes in performing for children ages 5 through 12, he has performed at schools, charity events, temples, churches, parties, restaurants, wine tastings and corporate functions throughout the San Fernando, Conejo and Simi Valleys. Stephen performs at parties and functions or provides magic lessons. Everyone loves to learn the secrets of magic! Here is a gift specially designed for your children ages 5 & older. Stephen will perform a few tricks and then have your children learn how to do some on their own! Supplies and personalized instruction are provided. Unique and lots of fun!! The entertainer behind Stephen the Spectacular is Stephen Levine. 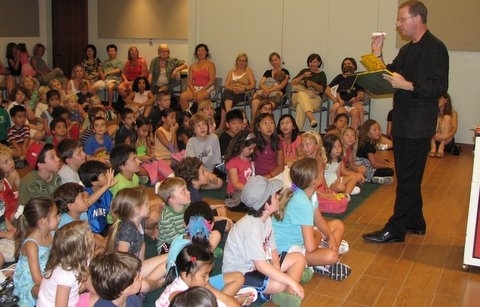 He is a magical entertainer with over decades of experience in entertaining children and adults alike! Stephen is a Los Angeles-based Magician who specializes in fun and funny entertainment using a combination of magic, story telling, and audience participation. Stephen is a family magic specialist who offers Birthday Party Magic Show Packages, and entertainment for family events, schools, groups and corporations. Tricks range from ropes, cards, to sword through neck, levitation and other illusions. Prefer a 6 foot table but not necessary.